If you follow us on Instagram, you know I’ve been sitting on this recipe for a while now with ample excitement. I’d been pondering how to make this recipe work for weeks, and after finally giving it a try, I’m SO pleased with the results. 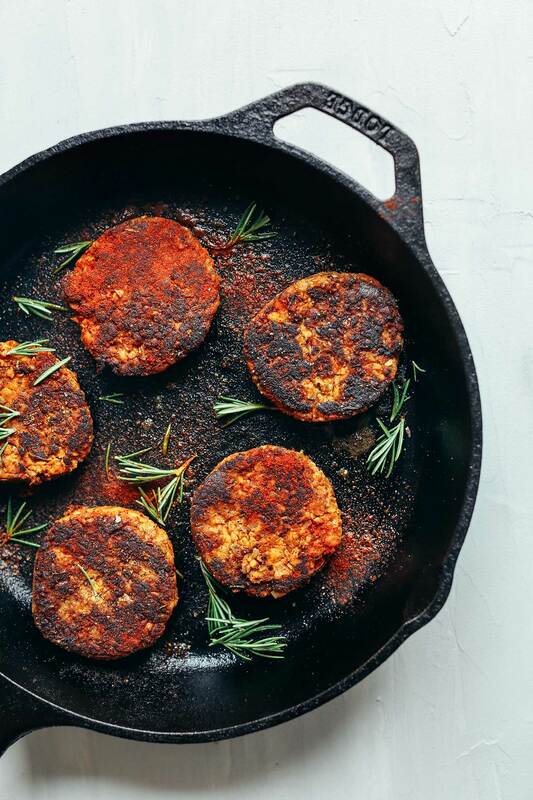 If you’re plant-based or trying to eat more that way, this vegan breakfast “sausage” is going to satisfy that savory morning protein craving like no other. Let’s do this! This recipe does require more ingredients than I typically use, but it’s for a good cause. Every spice adds another layer of flavor to make these undetectably vegan “sausages!” The simple factor comes with the 1-bowl prep to save on dishes and clean up time. The base of this “sausage” is tempeh, which mocks the texture of sausage perfectly. Next comes a mixture of smoky, sweet, and spicy seasonings like smoked paprika, cayenne pepper, thyme, and nutmeg. Vegan Worcestershire sauce adds a “meaty” flavor, while a bit of oil adds moisture. Garlic and onion add texture and even more flavor. The fun part is the mixing, which I recommend doing with your hands. You can also do this in the food processor, but I prefer mixing in a bowl so you get more of a chunky mixture and less of a puree. Plus, using your hands is more fun – trust me. I highly recommend cooking these on the stovetop for a crusty outer edge and a tender middle. But I also tried baking these and it works as well if you’re trying to avoid or cut back on oil. Either way, these “sausages” are a major win! These are the perfect breakfast companion for things like my Masala-Spiced Tofu Scramble, Breakfast Hash, Simple Tofu Quiche, and Crispy Hash Brown Haystacks. Not to worry – I am also going to be testing this recipe for an updated Biscuits and Gravy recipe as well as other breakfast entrées, so stay tuned! For more tempeh recipes, check out my Blissed-Out Thai Salad with Peanut Tempeh, Marinated Peanut Tempeh, Smoky Tempeh Burrito Bowls, and Simple Vegan Meatballs. If you try this recipe, let us know what you think! Leave a comment, rate it, and don’t forget to tag a photo #minimalistbaker on Instagram so we can see. Cheers, friends! Spicy vegan breakfast sausage made with protein-rich tempeh. Smoky, savory, and flavorful, and just 1 bowl required! A delicious, plant-based sausage alternative. Finely chop tempeh and add to a mixing bowl (or a food processor) along with remaining ingredients. Taste a small amount and adjust flavor as needed, adding more cayenne pepper or red pepper flake for heat, salt and pepper for overall flavor, brown sugar for sweetness, or paprika for smokiness. Cook for 3-4 minutes or until the underside is browned. Then gently flip (they can be fragile) and cook on the other side for 3-4 minutes more or until the underside is browned. *To keep this recipe gluten-free, ensure your tempeh and Worcestershire sauce are both gluten-free. * If cutting back on oil, you can bake these at 375 degrees F (190 C) on a parchment-lined baking sheet for 20-30 minutes or until golden brown and semi firm on the edges. *Nutrition information is a rough estimate calculated with 2 Tbsp oil (for mixing and cooking) per 5 sausages. Any suggestions to make them hold? These can be a bit tender (not as firm as a traditional sausage), but should hold together while cooking. 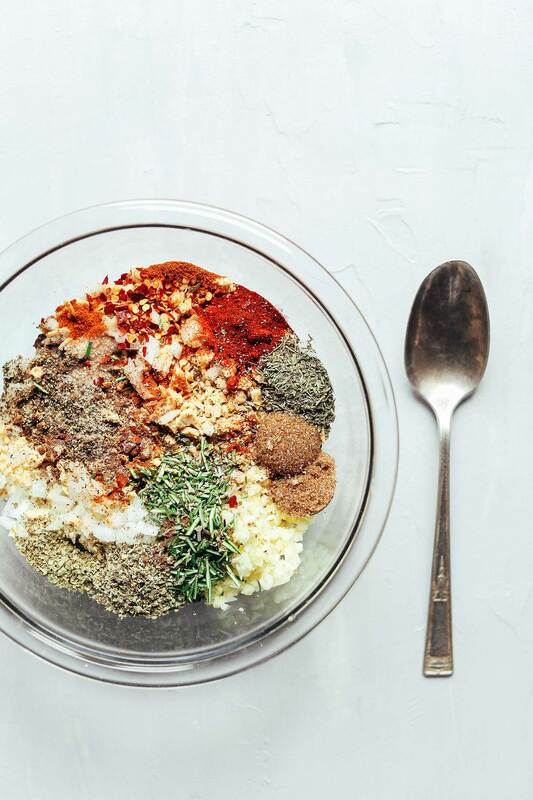 You could try adding the sausage to a food processor with cooked and cooled quinoa (~1/2 cup) If you give it a try, we would love to hear how it goes! So, I was too clumsy to keep my sausage from crumbling apart but if you throw in some potatoes this makes an AMAZING breakfast hash! Did you ever try this with biscuits and gravy like you mentioned? My husband loved biscuits and gravy and I have been searching for yummy savory breakfast alternatives for him! First of all let me say I love your website and your recipes. I also have your cookbook. I made these tripled yesterday because i’m having a Christmas brunch and when I tasted them they were a little bitter. I’m thinking it was the Worcestershire sauce, because it’s too much of it. What do you think? Could it have been something else? I did it per the recipe. Other than that, I’m sure we’re going to eat them and enjoy them! Hmm I’m not sure what that would have been.. did you change any other ingredients? It could have been too much Worcestershire sauce but its hard to say. I think next time I’ll use a little less Worcestershire sauce but after I tried them yesterday they were delicious! I’m newly vegan (5 months and counting!) and this was my 1st attempt at vegan sausage. Also 1st time using tempeh. So delicious and so easy to make! Thanks for the recipe…I’m glad I can make my own now instead of having to wait until I visit my favorite restaurant for a “sausage” fix. Yay! We are glad you enjoyed it, Paula! My husband and I tried to make these, but unfortunately they came apart when we were frying them. Any suggestions for how to keep them together better? We also flipped them with care, but the started falling apart even before we flipped them. The flavor was delicious, though! Hi Mindy! It sort of sounds like the tempeh just needed to be more finely chopped/mixed and/or you needed to add a bit more wet ingredients if they were dry, or dry ingredients if they were too wet. Not sure if you used a food processor or bowl, but a food processor might help bind them better. Hope that helps! Made these this morning and they were fantastic! I didn’t have fresh rosemary on hand, so I subbed dried. Otherwise I followed the recipe as written. They rested in the fridge about 16 hours, and came together wonderfully! Thank you for such a fantastic vegetarian option that tastes fabulous! I will definitely be making these again. Great recipe! Eating them right now! Just a tad to spicy, could leave out some of the cayenne or red pepper flakes and still be really good and I think I might try some flax egg to help bind them next time. I’m wondering how this would taste without the added sugar. We avoid all forms of processed sugar. What benefit does the sugar add? It is just for flavor but you can leave it out if preferred! Would maple syrup work as a substitute or is that considered a form of processed sugar? These look awesome! Has anyone tried to bbq them yet? How would they hold up? I made these and both my daughter and I loved them! When they’re cooking, and hey smell EXACTLY like the sausages I used to eat as a kid. I had these for breakfast with a little maple syrup, and they were divine! Just made these for “brinner”, along with a tofu/mushroom/sundriedtom/spinach quiche. They were delicious! I followed your recipe (+ fennel) for baking instead of frying, and found that they wanted to be flipped about 3/4 of the way through. That helped develop the exterior crisp texture too. The food processor plus firmly hand-shaping the patties contributed to keeping them from falling apart. Thanks for yet another fantastic recipe! Yay! A quiche is a perfect addition to these! These have a wonderful flavor, but despite using great care, they crumbled on me. I’m looking for a great recipe to use up all those delicious sausage crumbles please. Just made these and they are very tasty! There is so much flavor packed in them. I ended up adding in half a tsp of liquid smoke with paprika since I did not have smoked paprika. I do have a question though. Is there any way to make make it more of a firm patty than soft? Like adding in flax egg or would baking it help? Thank you! I think a flax egg could help with binding for sure. 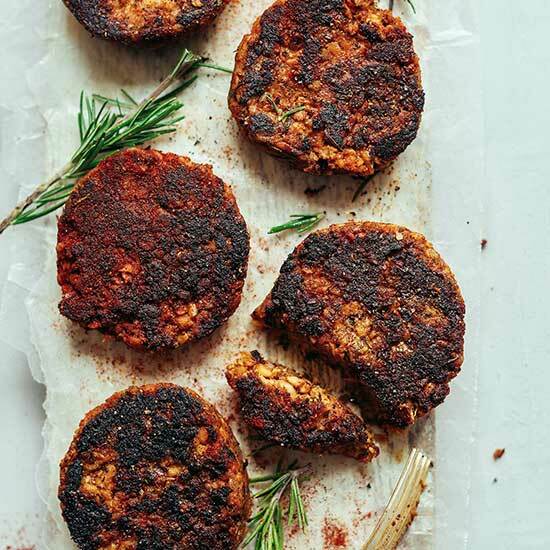 Another option might be blitzing in a food processor and adding something like cooked cooled quinoa, or baked (already cooked) beans, such as these falafel patties. Let us know if you do any experimentation! Thanks, I will let you know for sure. Definitely saving this to try (and yes, I am fully aware that I’m “necro-ing” this post from a year ago, because it’s nearly breakfast time and I’m hungry, so there! HA! Sigh…but I have to wait…3 whole days…whimper) but will likely leave out most of the “heat” and just go with the savory. I’m thinking this plus a vegan cheddar and a fried tofu “egg” on a biscuit, freeze them, take one out and pop it in the nuker for a quick breakfast bite at work? Ooooo yeah!!! 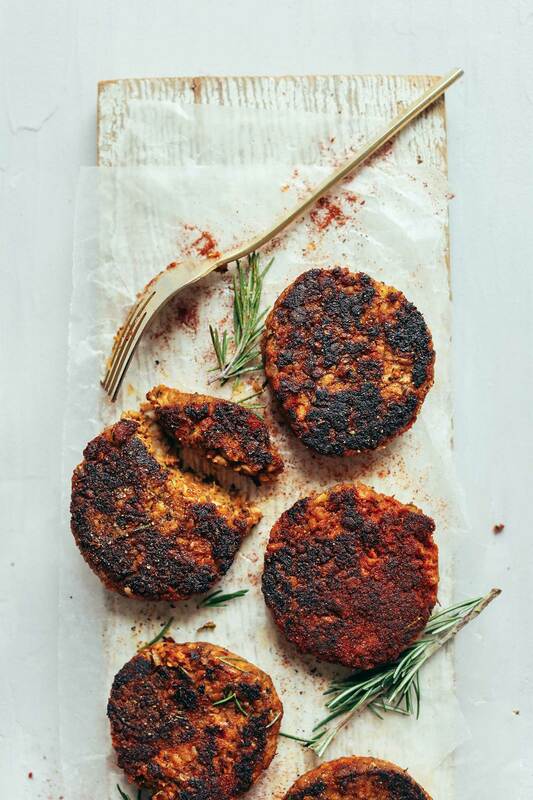 Never thought of using tempeh for a sausage patty, and you’re right – the texture is perfect! Thank you!!! I made these with a bunch of random spices I had on hand. Added a flax egg and let sit overnight in the fridge. Formed them this morning with plastic wrap and a measuring cup. I made sure to really press them in. I baked them at 425 degrees for 20 minutes, flipping after 15. They did not crumble Nd they were delicious. It appears that my stars didn’t show up. Still not working. Four star recipe! Thank you Dana! Hi Dana, your blog & recipes have been a lifesaver since being diagnosed Coeliac & then going plant based 6 months ago. A thousand thank yous ???? I cannot get gluten free tempeh here in Donegal, Ireland…..will a firm tofu work crumbled do you think?? I made this this morning and it was so incredibly delicious. I left it in crumbled form, cooked it then made a vegan biscuits and gravy. Thank you I will be making this again for sure! I formed these shaped spicy tempeh sausages using cling wrap and mini cupcake molds — worked like a charm! Then, I transferred them to the oven and they crisped up nicely along the edges. Afterwards I skewered them to make mini-kebabs — very cute and colorful! I posted a picture on my Facebook and tagged MB in it – check it out! Thank you soooooo much for this recipe! I have missed veggie sausages since having to go gluten-free, and this fills the bill nicely. I doubled the recipe and formed it all into patties, saving most of them in the freezer as “convenience foods” for later breakfasts. I omitted the Worcestershire sauce (none on hand) and used all the spices you suggested, even the optional ones, and these are very flavorful. They even got a thumbs up from a carnivore who tried them. 1) I didn’t use enough cornstarch? 2) I left the tempeh to marinate for almost 5 days. Did I leave it in the fridge for too long? Hi there! I was wondering if I could cook this as a crumble instead of in patties for a recipe? Im trying to find the perfect sausage for a vegan version of cream cheese and sausage dip from my non-vegan days. I think this will have the right flavor, just wondering if it will cook alright as a crumble? Thanks! I made them with a flax egg added, used the food processor and made sure my hands were wet when making the patties (to ensure they stuck together), they came out PERFECTLY! Thanks for this recipe! Hi! These sound wonderful! Do you think adding a flax egg would change the taste at all? I see a lot of people are having issues with the patties not sticking together. I think flax egg could work, though have not tried it! If you do, report back on how it goes! 1. Add vegan egg replacer as the “sausages” fell apart and were more of a crumble than a sausage. 2. The amount of raw onion and raw garlic was overpowering. I would definitely saute them both first next time and reduce the amount of both. 3. Since I love a sweeter breakfast sausage, I would add some finely diced apples, Vermont maple syrup and maybe some fennel as another commenter suggested. It’s a very good base recipe and I know I’ll make it again. Sounds great! Do you think I could roll this into a hot dog shape, bake and serve as a hot dog substitute? I haven’t tried it, but that could work I think! If you give it a try, report back on how it goes, Marie! I tried it and it works! Much better ingredients than any vegie dog commercially available. Tasted great is a bun with sauerkraut, ketchup and onions! Even froze some after baking and thawed them, then warmed in a skillet with a little oil and it worked fine. THANKS for the inspiration. You might want to try it and put it up as a Vegie Dog recipe; Yours have healthy ingredients than the others I checked. I can’t get enough of these sausages–I’ve made them twice now, and they’ve turned out perfectly both times. I mix the ingredients in a food processor, so although they’re fragile, they keep together well enough in the pan and on my plate (but between me and my husband, they don’t last long!). These are great vegan sausages. I did mine in the food processor and they seemed to stay together somewhat okay but I think the texture would resemble more of a sausage by doing the method she originally suggests by finely chopping everything but I can see how it would fall apart as mine did even in the food processor. I could have been extremely careful and maybe kept them together but it didn’t really matter for my dish. In addition, I will do a little less sage next time. But all in all successful! Thanks for sharing these! I don’t cook with oil, so I omitted the oil & baked them as instructed & they were delicious! Honestly one of the best recipes I have ever made. A favorite among vegans and non-vegans. I can’t stop raving about it enough! Looks incredible! 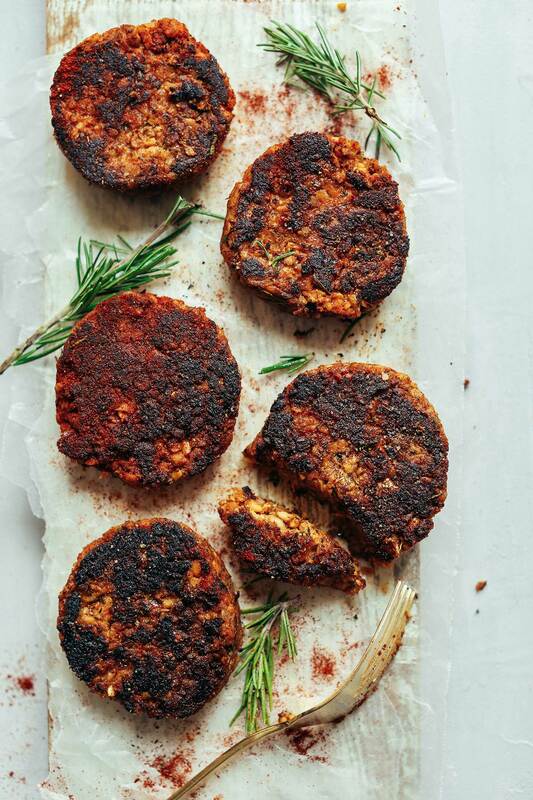 I can’t think of a better spice combination for these tempeh sausages! Hi! If making to freeze would you suggest pre cooking and then freezing, or just molding and freezing on a tray before placing into container ? Thanks! Hi Ashley! I recommend making the patties ahead of time, freezing them uncooked, and then thaw before cooking. These were absolutely delicious in texture and flavor! Next time I’ll cut down on the cayenne by a tiny bit, it’s just a little too much for me. I omitted the dried sage (because I didn’t have any on hand) but didn’t think it was missing from the recipe. I just upped the other herbs and all is good. Have been following your recipes and makes up for a lot of our weeknight dinners. Is there a specific type of Tempeh you use ? I typically get them from Trader Joe’s and I find them grainy unlike some of the restaurant ones we have tried. Any suggestion ? Okay, first off: this tastes FREAKING AMAZING! I would recommend this as an alternative to Thanksgiving stuffing for sure, instead of trying to make patties, as it is very crumbly. Any tips on how to make this stick together better in sausage form would be appreciated though! These were very easy to throw together last night and then cook first thing this morning (even on a weekday! ), which is already a plus in my book. I’m always looking for quick breakfasts for my family. My kids loved them, and my brother who was visiting said they were delicious. (I wasn’t the least bit hungry and didn’t try them, but they smelled wonderful). They did tend to fall apart, but when handled delicately I was able to make whole sausages. I followed the recipe as written, except I did not have Worcestershire sauce so I used a steak sauce, and I made the sausages a bit smaller. I was super excited about this because breakfast sausage used to be one of my favorite foods and had never really had a good meatless one. When I cooked them up for breakfast per the recipe, they were not my favorite. But the same night for dinner I sauteed the sausage with some kale, garlic, and mushrooms and it was amazing! By itself, not my favorite, but within a dish, it was amazing! This recipe is just like a Persian dish which we call it KOTLET, I wish you post Persian recipes on your websites. See step 8! Store leftovers in the refrigerator up to 3-4 days or in the freezer up to 1 month. You can also make patties ahead of time (up to 1 month), freeze (uncooked), and then thaw before cooking. I made these for a brunch get-together even though we are neither vegan nor vegetarian! They were a-mazing! I’ve added this to my brunch menu list (and trust me, not many items make it to that list!) Thanks Dana! Thank you for this Dana! You rock my world, seriously, what would I do without you!? Made this into a breakfast burger with your eggplant bacon and hollandaise from everyday cooking… AMAZING! My meatetarian husband loved it, blew his mind! I made this with biscuits this morning. You are right it is very delicate to handle however it did stay together and we loved the flavors! Texture is different and soft a very nice alternative to pre-vegan days of good ole’ pork. I am going to try and sub a mashed bean for the Tempeh. We had never tried Tempeh but we were pleasantly surprised. Husband loved it with his biscuits and white bean gravy! Thank you for sharing and creating! Do you think this could be rolled into round balls and fried/baked to resemble meatballs? I am beyond words excited to try this recipe (I adore your blog – and return often to make everything on here – with great results). If I were to make this and turn it into a ‘mcmuffin’, what might you suggest I pair with this. Any other suggestions (i’m trying to avoid a tofu scramble). This recipe sounds delicious :) I live in the UK and I’m struggling to find tempeh in my local supermarkets, I’ve seen that I can source it from amazon but I don’t have much experience with tempeh so I am a bit unsure about what to look for. Can anyone suggest an alternative or had any experience with sourcing it online? These patties have been calling my name since I first saw it posted a couple days ago..gosh do they look yummy! The only ingredient I’m missing is (oddly enough) sage. I realize the flavor is completely different, but I was thinking fennel would be a good addition and blend well with the other herbs. What do you think, Dana? Others have asked this question as well! I think fennel would work well! Hi Abi! These can be a bit tender (not as firm as a traditional sausage), but should certainly hold together while cooking. I’ve never used vital wheat gluten but if you give that a try let me know! I can’t wait to try these!! Thanks for another great looking recipe! Hi Dana! Thanks for sharing the recipe!! I tried making these this morning and while everything tasted delicious, I had a hard time keeping the sausages together. Eventually, I just gave up and made a sausage crumble (still totally yummy! ), wondering if I did something wrong? Thanks! Hi Natalie! Sounds like the tempeh just needed to be more finely chopped/mixed and/or you needed to add a bit more wet ingredients if they were dry, or dry ingredients if they were too wet. Not sure if you used a food processor or bowl, but a food processor might help bind them better. Hope that helps! I just tried them and they are delicious! I used a food processor but mine also fell apart. I wonder if you could use a bit of aquafaba to bind them? Would it work like egg, do you think? Hi Ellie! It sort of sounds like the tempeh just needed to be more finely chopped/mixed and/or you needed to add a bit more wet ingredients if they were dry, or dry ingredients if they were too wet. Not sure if you used a food processor or bowl, but a food processor might help bind them better. Hope that helps! Thanks Dana. They were processed pretty fine in a food processor (mentioned above). But I could add a bit more oil, I guess. I doubled the recipe, the rest is in the fridge. A bit of aquafaba would add more liquid without changing the flavour. Might try that with the rest. I haven’t tried this recipe yet, but it sounds great! Perhaps some flax meal mixed with a bit of water might make a good “glue”. I’ll let you know if I try it! Did you try this out? I have a hard time making mine stick together and am considering using a flax egg. Would love to hear your thoughts! Hi. I’m a real fan as well, and look forward to trying this. What I’m looking for is bulk “sausage” to cook up for a pizza topping and for mapo tofu. I was going to ask if it would fry up into bits if cooked from bulk. But so many people have had trouble keeping the patties together I think my question is answered. Has anyone mixed up the ingredients and just tried browning and breaking up the mixture for a crumbled cooked texture? I know this was months ago but I made these this morning and had a hard time keepong them together so I did just that and made a “fauxsage” crumble topping and put it on top of half of a sweet potato. It was delicious! Can’t wait to put the rest on a pizza. “Fauxsage” — I love it! Thanks Allison. Haven’t tried this yet, but you encourage me to give it a shot. Girl… I used to be hooked on MorningStar veggie sausage patties and haven’t had one in sooo long. Need this tempeh version in my life ASAP. Totally going to make an egg and sausage english muffin sandwich with it! I also was surprised you did not have fennel seeds in the recipe since that is what I miss most about sausage. If I wanted to add fennel to the recipe, how much would you suggest? Thanks! Just made these and they taste great! I used homemade worcestershire sauce . Going to make a double batch and freeze them to have on hand. Could one use stevia instead of coconut sugar or brown? Thank you! This recipe is brilliant! I love how using certain spices can make humble plant ingredients remiscent of meat. Yum! Can’t wait to try. Hi Dana. Big fan here. I live in Chicago and I’m having trouble finding gluten free tempeh. I’ve looked in WF and other smaller health food stores but all the tempeh has gluten in it. I’ve looked online for a place to order and no luck either. Where do you get it? And Which brand? Try the lightlife brand? Lightlife is found at all Whole Foods in my area in the same section where you find the tofu. Their original tempeh just has soybeans, water, and brown rice. Just google lightlife, since I am not sure I can put links in my post. Thanks Haley. I’ve seen the light life brand but maybe they didn’t have the original when I was looking for it because I remember checking the ingredients and they had gluten. I’ll keep an eye out for the original. I believe the Tofurkey brand is GF! Have purchased it and loved it. Hi JP! I just get mine at Trader Joe’s! I found a place online which may help! Good luck! I’ll let you know soon, can’t wait to try your recipe! I think I’ll make some with and some without. Will report back soon-thank you Dana! Hi this looks wonderful! I was curious if fennel seeds might be good in this recipe since they are often in meaty breakfast sausage, any thoughts? Hi Janet! Great idea! I think that would work well. Report back on how it goes! I was also wondering if steaming the tempeh is necessary. I typically steam my tempeh for the purpose of better flavor absorption. Not necessary! I tried it both ways and both ways worked fine. Seriously so excited to try these. My local vegan eatery makes a killer breakfast sausage sandwich, and it’s seriously to die for. Oh, yummy! I’ve been wanting to make some vegan sausages for a while now. But vegan Worcestershire sauce isn’t available where I live. Could you recommend a substitute? Tamari maybe? Try tamari or coconut aminos! There are recipes for vegan Worcestershire online. I recently found one through Martha Stewart’s website. It was pretty east to make, vinegar, sugar, soy sauce.